Jeyashri's Kitchen is 6 today. Yes, very happy to share a sweet recipe on this day. It was the same day 6 years ago, i stepped into the blogging world with a Paal payasam recipe. Six years rolled very fast. With all gratitude to the Supreme power, i would like to extend my thanks to my family members who always encourage me in whatever i do and appreciate my endeavors. Thanks to Raks, who always helped me technically during my initial stages of blogging and still clarify my silly doubts too. I am gifted with very good friends and all of them used to encourage me, appreciate me and point out the areas where it needs improvement. Above all, thanks to all my dear readers, with your support, i am sure i will continue to grow heights. Thanks to all the media people for giving me opportunity for contributing recipes to their esteemed magazines. Special thanks to Vikatan publications for publishing my first cookbook. 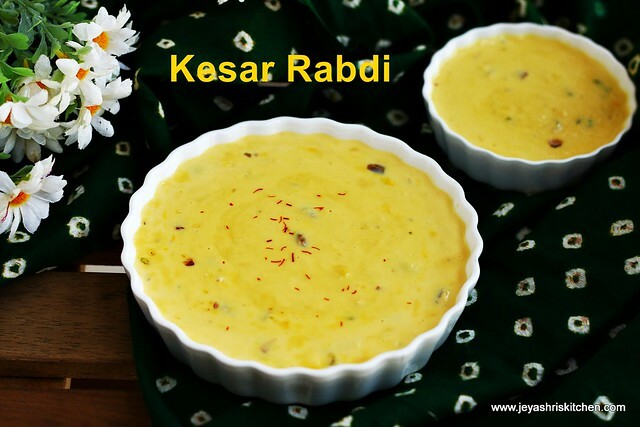 On this occasion, presenting you a super delicious sweet Kesar Rabdi. Stay connected with jeyashris kitchen and support me as always. With all your wishes here comes a new recipe from Jeyashri's Kitchen on it 6th blog anniversary. 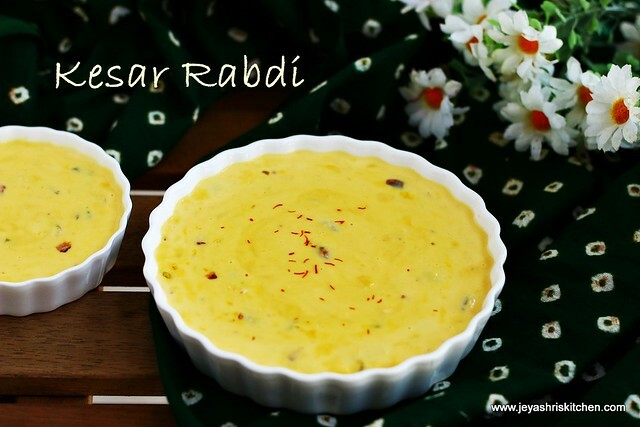 Rabdi can be served as such as a dessert or can be served with gulab jamun or jalebi. In a deep and heavy bottomed pan add milk . Bring this to boil and keep the flame low. Scrap the sides, whenever needed and let this boil for 15 more minutes. Add the saffron milk to this and mix well. Continue to boil this stirring frequently. Once the rabdi reaches a thick consistency, switch off the flame. Add the sugar and mix well. Add cardamom powder. I didn't add. You may feel it is turning watery after adding sugar. But do not worry. It will be perfect once it is cooled down. Do not add sugar while the flame is on. This may curdle the rabdi. Chop the nuts finely and sprinkle on the rabdi. Mix well. Rabdi will taste so nice when serve chilled. Adding fresh cream is optional. I had some cream left over and also since i am travelling wanted to use it up. You can make it plain without adding saffron to this. If you wish to add condensed milk you can add so instead of fresh cream too. In that case reduce the sugar. 4 tblsp of condensed can be added. Superb, congrats and keep it up :) So proud of you! Congrats Jey. I'm a great follower of your recipes but have never left a comment till today. Wishing you many more years of successful blogging. Congrats on your milestone. 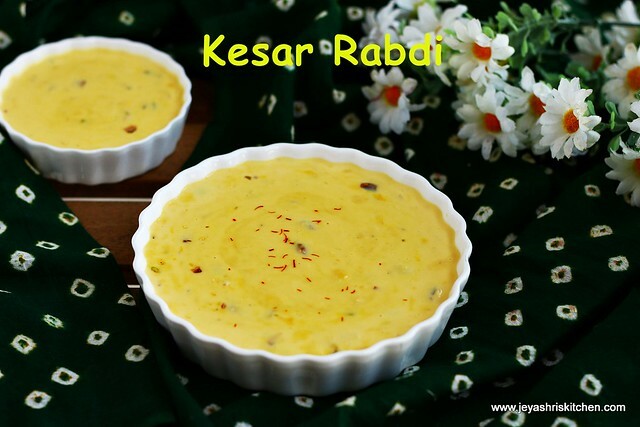 Kesar rabdi looks delicious. Congratulations on successful completion of six years. Wishing you many more to come in your way. Keep rocking!! Congrats Jeyashri, You Rock! Keep going....!! But now couldn't be silent. Hearty wishes for your success , hard work and effort. Thank you so much for the wishes. Thanks for all your support. All your wishes will make me reach heights.